The free D-View 7 Network Management System comes with a license for 25 nodes and 2 probes and full access to the management tools. Optional upgrade licenses allow you to broaden your network and analysis. The graphical dashboard gives you the real-time monitoring status of your network. D-View 7’s highly customisable scheduling system, allows you to assign tasks to be issued during off-peak hours or any other planned maintenance time frame. You can divide a network into multiple workspaces based on different management scopes and your organization’s hierarchy. Users in a particular workspace can create their own independent environments, making this an extremely useful tool for any organization with a large IT team to manage network by geography, functional responsibility or organizational hierarchy. D-View 7 supports various predefined configuration templates which helps you manage multiple devices easily. For complex configuration, D-View 7 also has the ability to deploy CLI scripts across multiple devices simultaneously. This allows D-View 7 to support a wide range of configuration features and virtually any device as long as it supports CLI settings. You can enjoy peace of mind knowing that routine maintenance tasks and configurations will be automatically managed and monitored by D-View 7’s event notification system. D-View 7 is organised into a server-probe architecture, which simplifies data collection across complex networks. 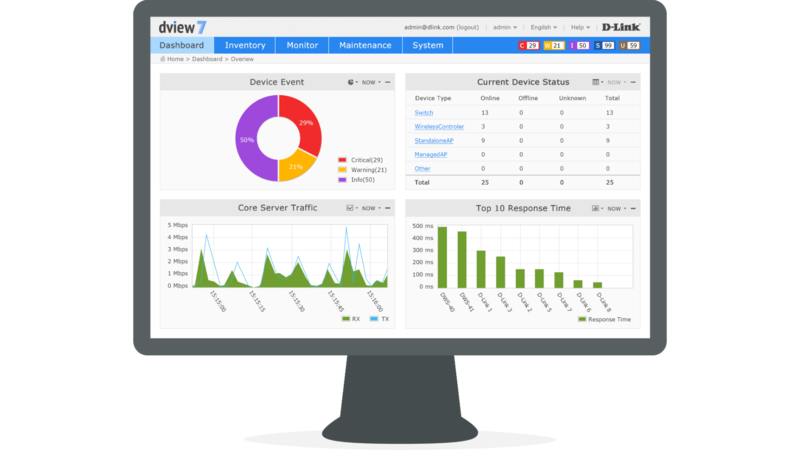 Monitoring and configuring multiple devices, even those behind firewalls or a NAT, is now possible with D-View 7 at any remote location. Remotely deployed probes will automatically tunnel home, allowing for the management of devices that cannot be directly accessed using standard SNMP. When a device is selected for management, D-View 7 probes will relay the command to the devices and then report back its data to the D-View 7 server. You can customise the SOID and related information of virtually any third-party device which lets D-View 7 identify many third-party devices and manage them. D-View 7 can then check the health status of those devices, issue CLI commands, and do the standard management and monitoring. D-View 7 also functions as a trap and syslog server which can collect all of the trap or syslog data from multiple devices across a network. This gives you a centralised place to collect important data. The advanced search system lets you set keyword combinations, and generate alarms based on events that are reported in the trap or syslog feature.